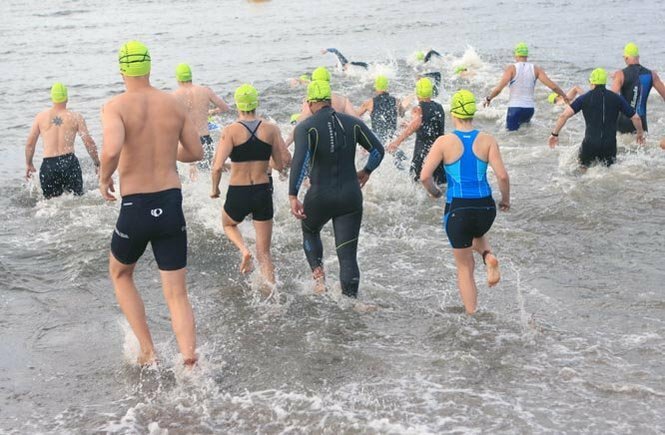 For those of us who do multi-sport events, notably triathlons, it might have occurred to you that why do the triathlon distances seem to have shorter legs (time wise) for swimming relative to the other two sports? This is an interesting topic and the idea of having more uniform triathlon distance , known as the Equilateral triathlon has been proposed. In 1978, during the awards ceremony for a Hawaii running race, a debate ensues among competitors about who is more fit, runners, swimmers, or cyclists. One of the participants, Navy Commander John Collins and his wife Judy, dream up a race to settle the argument. They propose combining three existing races together, to be completed in succession: the Waikiki Roughwater Swim (2.4 miles), the Around-Oahu Bike Race (112 miles, originally a two-day event) and the Honolulu Marathon (26.2 miles). Whoever finishes first, they would call Ironman. Fifteen men participate in the initial event held on February 18; 12 complete the race, led by the first Ironman, Gordon Haller. His winning time: 11 hours, 46 minutes and 58 seconds. The truth is the current triathlon distances from sprint all the way to Ironman (140.6) and beyond typically favor stronger runners and cyclists because such a large percentage of time in these races is spent doing these two events. That’s not to say that competitors in these events are slouches when it comes to swimming, it’s simply that in terms of time spent in each leg of the sport, swimming gets short-changed a bit, so a naturally a stronger swimmer who is weaker in the other two legs is disadvantaged. So the answer to John Collins original questions who is more fit? runners, cyclists or swimmers… isn’t really answered, sure we answered who’s more fit over the three sports when you string them back to back , but stronger swimmers will always be disadvantaged because of the shorter percentage of time they spend in the water. The Equilateral triathlon proposed in the early 80’s and 90’s is an attempt resolve the issue that most triathlon distances have an inherent bias towards runners and cyclists. By normalizing the swim segment (time-wise, reducing distance of the run and bike segment) and bringing it closer to the length of times that it takes to complete the swim leg. The proponents such as Fletcher Hanks and Wainer and De Veaux proposed that a ratio of roughly 1:8:3.5 for distances of swimming, cycling, running would equate to about 33% time spent in each of segments of the race. Of course exact time equilibrium is impossible because of varying competitor abilities, but this format allows for more uniform time distribution for all three legs. Naturally increasing the swim distance and reducing the bike and run distances allows for a more equitable time distribution. Needless to say the challenge at the longer distances is the much longer swim leg. Swimming for a 1.5 hours really does test the mettle of an athlete, not to mention that increased time in the water at those longer distances, likely causes safety concerns due to fatigue and logistics (after all it is the reason swimming is the first leg of the race, to minimize exhaustion and increase safety). Also the increased swim legs and reduced bike and run legs, may not appeal to the majority of athletes, as there’s pretty strong anecdotal evidence the vast majority of triathletes are originally former riders or runners. So what are your thoughts? should there be more Equilateral triathlon? Do you have a suggestion as to how each leg can be more “fair” .. or should triathlon be left as is? I think stronger swimmers would all be in favor of more equality, but the reality is the large percentage of folks who does these events are stronger runner/cyclists, so its a bit harder for race directors to justify much longer swim legs relative to the other two.. I think an equilateral could have potential to attract more young athletes to the arena of multi sport events. Just based on my experience in high school, almost all schools had a running/swimming team. Few had a cycling team or even club. If young runners and swimmers had more competitive advantage in equilateral over traditional, it might entice more to sign up. It is hard to say how this population would stack up against all the old cycling farts who can’t swim (and love the short swims and longer bikes of traditional). What about a Reverse Equilateral Tri? Run first, then cycle, then swim.